How do you make a sad or blue day just a little bit better? While I'd like to think that a bowl of sliced fresh peaches or crunchy carrots is the answer, it doesn't always work that way with kids. Case in point was the other day when I made this recipe. One of my little troopers was having a tough day so I tried to brighten it a little with a special treat. 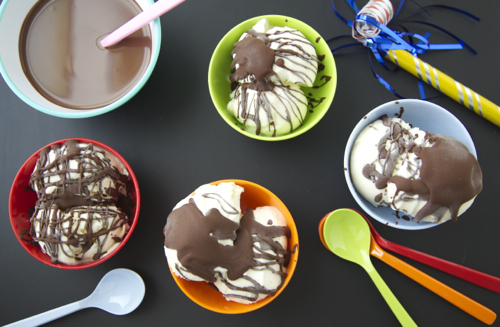 In our house, chocolate can be one of the paths towards happiness, so I filled two small bowls with luscious vanilla bean ice cream and let the kids drizzle on a bit of my homemade Magic Shell. They had never seen anything like it. Just like my own first experience of squeezing it onto ice cream out of the tube when I was a kid, they totally enjoyed the same fun (only without all the unnecessary additives). They couldn't believe how it hardened when it touched the ice cream and even better, they loved cracking it into tiny pieces with the side of their spoons. Within minutes their frowns were turned upside down. P.S. I'll be on the Today Show tomorrow, Tuesday, Sept 18th at 9_45am. I hope you can watch me cook from the Weelicious Cookbook, but if you're out and about, set your DVR! 1. In a microwave safe bowl, combine all ingredients. 2. Microwave in 30-second increments until melted and smooth (this may also be done in a small saucepan over low heat until all the ingredients are melted). 3. Pour over ice cream and watch the magic happen! what?? it's just coconut oil that makes it harden?? awesome - thanks for letting us know about this magic - I'll never have to buy the stuff in the bottle again. p.s. LOVE your recipe ideas - thanks for keeping it simple and making me not feel so guilty when I want to give my kids treats! I LOVED Magic Shell, can't wait to let the kids try this! Can the leftovers be saved? You can refrigerate the leftovers for about a week. It will harden a bit in the fridge, but just re-heat to soften! Anything you can use instead of coconut oil? Other versions of this recipe just use vegetable oil with the same results. I've made it with coconut and veg oil - either works! Yum! We also ad chopped nuts to our version to make my son's \"rock sauce\". I'm pretty sure the coconut oil is the magic ingredient in this because it hardens when cool. I don't think other vegetable oils do that. I have only tried this with coconut oil, which lends a great flavor! I have seen others use vegetable oil. PERFECT recipe and so, so much better than that other stuff! Have my DVR ready for tomorrow! Congrats!!! This will be yummy on frozen bananas! Looks incredible! Im buying the ingredients tomorrow. Good luck on the Today Show! Can't wait to try this and I received my Weelicious cookbook today too.! So excited to try the new recipes! I can't wait until your new cookbook comes out! It's on my Birthday wishlist!! Love the two recipes from the Today Show, but geez think they can slow down just a tad, rushed you right through! You can also Nutella in place of chocolate chips - it's amazing!